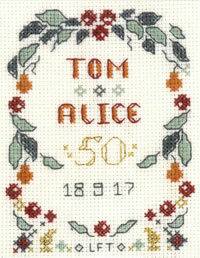 A cross stitch 50th wedding anniversary card cross stitch kit to stitch for a special Golden wedding anniversary gift. The Window 50th Anniversary card has delicate detail in three square windows. The kit is stitched in shades of yellow gold with a heart charm and glinting gold metallic thread. The card has three different windows which show initials with a heart charm, a ’50’, and a lucky gold horseshoe in ornamental borders. A variegated thread is used to give a subtle change of colour in the border. 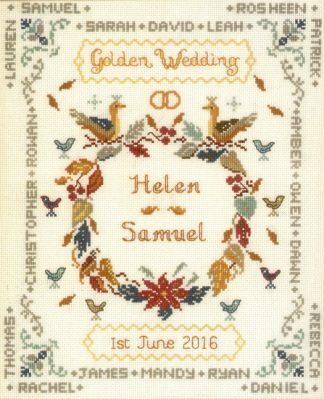 This Golden Wedding Anniversary cross stitch greeting kit has only top quality materials; Zweigart fabric, DMC and metallic threads, charm, needle, card and envelope. A full alphabet is provided so that you can add the initials of the anniversary couple. This Window 50th Anniversary card design is part of the Decorative Textiles collection. It is part of the range of anniversary cross stitch samplers.